Exploring American Histories opens an entirely new window into the many histories of the nation’s past. It integrates an unprecedented number of primary and secondary sources—both written and visual—in a unique building blocks approach that enables students to hone their analysis skills while they actively learn the fundamental concepts of American history. 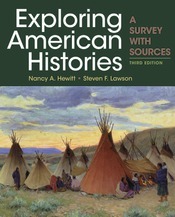 By weaving sources into the story and culminating in multi-source projects organized around a single topic at the end of each chapter, the book brings history to life while helping students understand how sources form the basis of historical narratives and how to think critically about them. Available for free when packaged with the print book, the popular digital assignment and assessment options for this text bring skill building and assessment to a more highly effective level. The greatest active learning options come in LaunchPad, which combines an accessible e-book with LearningCurve, an adaptive and automatically graded learning tool that—when assigned—helps ensure students read the book; the complete companion reader with "Thinking through Sources" digital exercises that help students build arguments from those sources; and many other study and assessment tools. For instructors who want the most affordable way to ensure students come to class prepared, Achieve Read & Practice pairs LearningCurve adaptive quizzing and our mobile, accessible Value Edition ebook, in one easy-to-use product.